James and the Giant Peach at Lincoln Park! 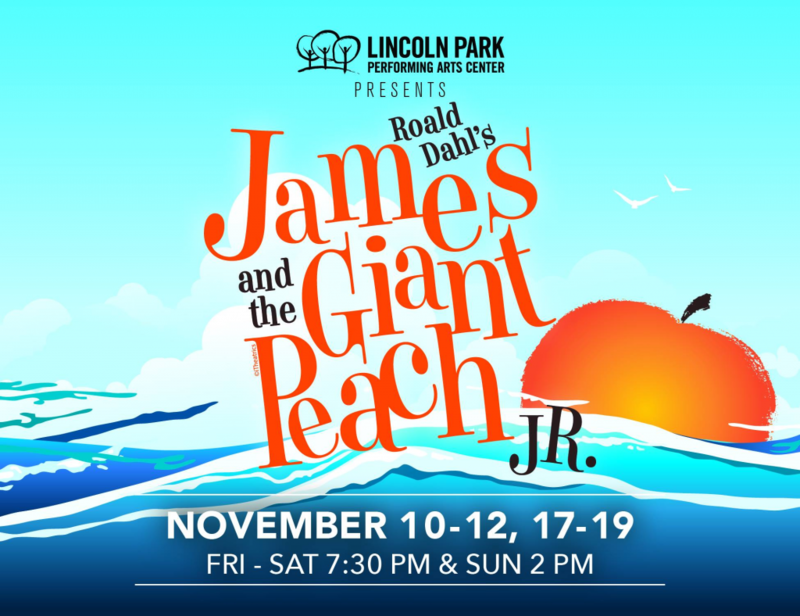 If you’re looking for local family-friendly entertainment this weekend, check out the Lincoln Park Performing Art Center’s presentation of James and the Giant Peach Jr. with six performances between Friday, November 10th, and Sunday, November 19th. This production is 60 minutes long without an intermission. You may remember Roald Dahl’s original story from 1961 or the classic Disney film adaptation from 1996. James and the Giant Peach Jr. is a musical performance based on Dahl’s captivating tale of orphaned James Trotter, a boy who escapes his horrible aunts on a giant peach. 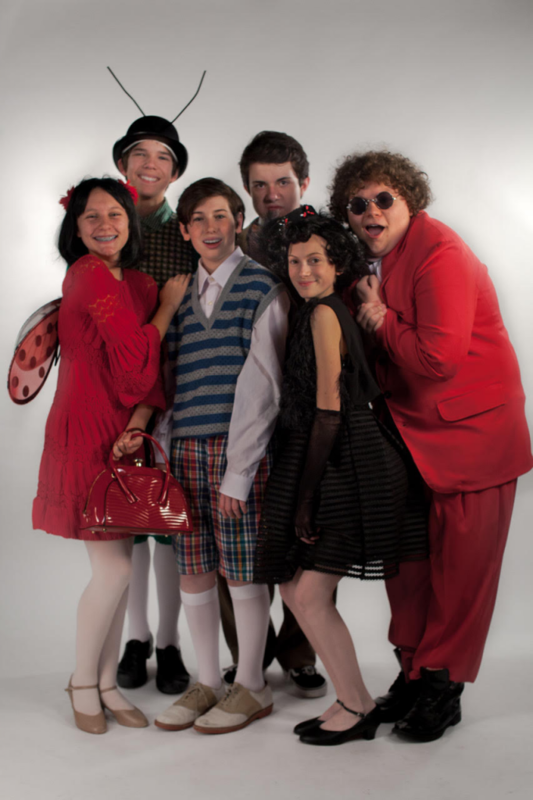 James, played by 7th grade Cameron Tino, meets Ladybug (Hannah Post), Grasshopper (Nicholas Vanhorenbeck), Centipede (Dominic Raymond), Spider (Clare Rectenwald), and Earthworm (Tyler Pintea) aboard the peach. These new and magical friends become family as they travel across the ocean together when the peach falls from its tree into the sea. James acts as captain in a fantastic tale of self-discovery and adventure. A lot of work went into bringing this musical to life. The central part of the set was built in-house. Many builders worked to construct the giant peach out of wood and fabric. The cast of 52 also came together to learn choreography and the music written by Oscar and Tony Award-winning songwriters, Justin Paul and Benj Pasek. Lincoln Park Artistic Producing Director, Justin Fortunato, commented on the amazing work and dedication of the cast. “We’ve always planned to perform the show with our students from the Lincoln Park Performing Arts Charter School as soon as possible because – and I think Ronald Dahl would agree – young people are capable of amazing things. James is a child put in a remarkable situation, and with the help and support of some new friends, he is able to achieve great things. Similarly, these Lincoln Park students are working together in extraordinary ways to present this musical,” said Fortunato. Tickets for this weekend’s performance are selling fast, so make sure to get yours today to reserve your seat. Tickets for the orchestra section are $18 and $20, and tickets for the balconies are $15 and $20. Purchase yours by calling (724) 576-4644 (option 2 for the box office) or online at www.LincolnParkArts.org. Atrium doors open one hour before curtain. The theater doors open a half hour to curtain. All parking at Lincoln Park is free. 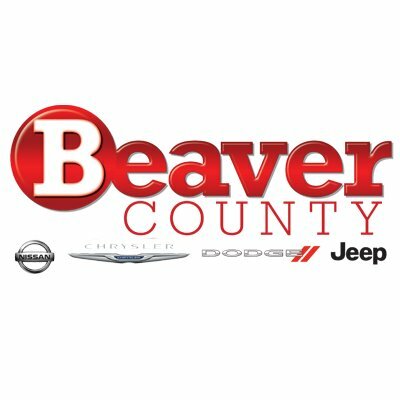 Parking is available in the parking lot directly behind the building, the lot behind BP Gas Station, the lot located at 900 Midland Avenue, and in the lot on Beaver Avenue on the 10th Street side of the building.  Archived in Attractions, Events.